From executive producers Shawn Ryan (The Shield, Angel) and Pulitzer Prize-Winning Playwright David Mamet. They are The Unit, a covert Special Forces team operating outside the usual military chain of command. Whether stateside or abroad, these heroes are on the frontlines protecting U.S. citizens and foreigners alike, slipping in under the radar and risking their lives to save the day then leaving just as quietly without any well-deser.. They are The Unit, a covert Special Forces team operating outside the usual military chain of command, risking their lives on undercover missions at home and abroad. Their identities are highly classified, a secret that's also fiercely guarded by their wives. But despite the men's determination to protect their families from the dangers of the job, they've learned that the enemy they have defeated in the field is also capable of bringin.. 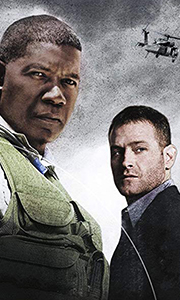 They are The Unit, a covert Special Forces team operating outside the usual military chain of command, their identities highly classified as they risk their lives on dangerous missions. The men are thrust into their most perilous situation yet when they discover The Unit is on stand-down pending a criminal investigation of their actions. These suspicions quickly escalate to physical assaults, forcing the men to use the skills they've ho..
Executive producers Shawn Ryan The Shield and Pulitzer prize-winning playwright David Mamet. They are The Unit, a covert Special Forces team operating outside the usual military chain of command, risking their lives on undercover missions at home and abroad. Packed with explosive action and edge-of-your-seat suspense. Now you can enjoy all four seasons of this groundbreaking show, for the first time ever in one DVD set. Special Feature.. Packed with explosive action and edge-of-your-seat suspense, The Unit delivers a nonstop blast of spectacular thrills and hard-edged excitement! Risking their lives on deadly undercover missions around the globe, the Unit is a highly skilled, ultra-secret contingent of special forces soldiers operating outside the traditional chain of military command. In the final season, the hunters become the hunted as the team and their families are..